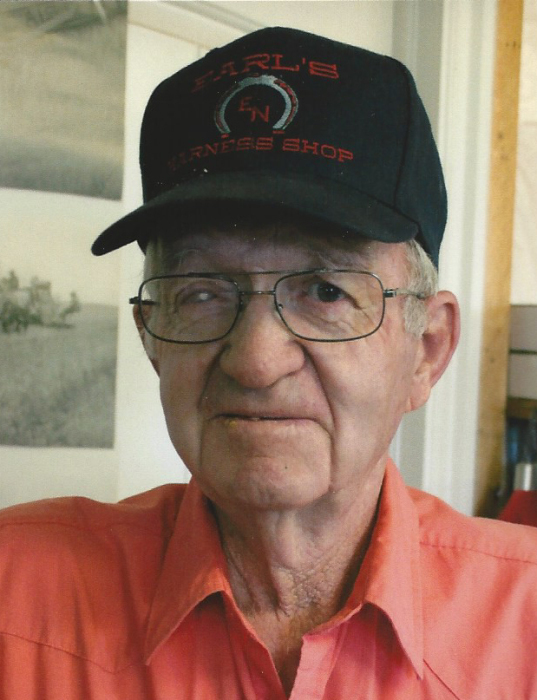 Earl Calvin Nelson, 86, passed away in Preston, Idaho. He was born August 6, 1932 to Vernon Woodruff Nelson and Etta Mae Keetch. He had four brothers and four sisters, Dorene, Harold, Arlene, Lois, Forrest, Reed, LaGrande, Carol Jean. At the age of three years old, he started driving the team of horses while the cows were being fed. His first love for all of his life was horses. He loved farming with them and enjoyed that up to the last three years of his life. He loved riding them, bucking broncs, saddle horses. He loved driving a team of horses. He would break them to ride. His second love was being a cowboy. He loved riding the range, herding cattle, he loved round up time. He loved the great outdoors. He loved participating in rodeos when he was young and loved watching them as he got older. He enjoyed going to pulling matches. He always owned a team of horses during his life. He loved his country and was fiercely patriotic and grateful for his freedom. He served in the army during the Korean War as a Pole line man. He was an excellent carpenter and could build anything to perfection. He ran a dairy for many years. He believed in hard work and could out work anyone young or old. When he was in his forties, he taught himself how to do harness work and build harnesses and saddles and bridles and leather work. For the next 50 years he did amazing work in this business, working everyday right up to the end of his life. He married Gloria Rigby on May 19, 1953 and for the next 50 years they spent their life together raising nine children, moving all over God’s green earth, and pulling together. Gloria died on September12, 2003. On May 26,2007, He married Mary S. Ingalls and they spent the last 12 years enjoying life together in their golden years. He is survived by his wife, Mary, Children-Kurtis(Judy) Nelson, Preston ID, Becky Jo Nelson, Logan UT, Randall (Tami) Nelson Mesa AZ, Suzanne (Kipp) Norman Preston ID, Jeffrey (Terry) Nelson, Elko, NV Michael (Dorothy) Nelson Lyman WY, Daniel (Carissa) Nelson, Columbus IN, Melissa (Pernell) Cleverley Elko, NV. Phil Kent (son in law), Richfield, ID. His Step Children: Jim Shaffer Logan UT, Kathleen (Marvin) Bunderson Brigham City UT, Joanne (Kirt) Nylander, Calis Siera Madra, Claire (Jerald) Jeppeson, Aloha, OR. Keith (Theresa) Gabel, Ogden UT, and Michelle Morgan, Eugene, OR. He is also survived by a brother, Reed Nelson; and sisters, Lois Woodward and Carol Jean Smith. Between He and Mary there are 71 grandchildren, 102 great grandchildren, and 2 great, great grandchildren. He was preceded in death by his wife, Gloria, two daughters, Vickie Kent and Heidi Nelson, 3 brothers and 2 sisters. Earl lived a rich and full life full of many amazing experiences. He had a great sense of humor and entertained us constantly with his songs of nonsense, stories and poems. He could talk like Donald Duck and entertained us many times with this talent. He loved his family and was proud of each and every one of them and made them all feel important and loved. His grandchildren and great grandchildren deeply loved and admired him. Dad, you will be so missed. We will miss your quick wit and your laugh, We will miss all the kids screaming because you are teasing them. We won’t miss your feeding the horse some oats. We will so miss the sleigh rides and the sounds of the jingle bells on the horses. Thank you for your example of hard work, Thank you for teaching us to stand up for what we believe in. Thank you for teaching us to believe in God and to keep Him near us always. Thank you for all your hard work and sacrifice for our family. We all love you and miss you already. We can’t wait until we meet again. Thanks to the Franklin County Medical Staff who took such good care of him.